ZTE is not exactly the most well known of smartphone manufacturers. 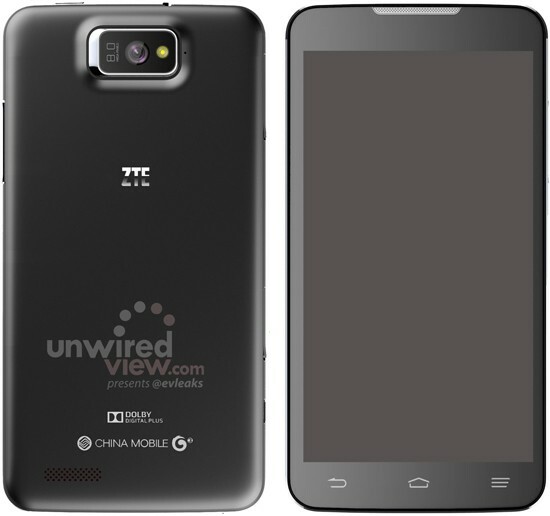 However, the ZTE P945 leaked device could be making a splash at CES 2013. Thanks to leaked images from @evleaks, we can take a look at what ZTE might have up their sleeve for this week. The device, pictured above, is known only by its codename (P945). As for the device itself, rumors and speculation have the P945 sporting a 5.7 inch 720 x 1280 pixel display. Pushing all of those pixels will be a 1.2GHz quad core ARM Cortex-A9 MPCore. Although you won’t be getting a 1080p screen with this smartphone, the quad core CPU will make up for it. Any new Android device is expected to be running 4.0+ by now, and 4.1.1 Jelly Bean could be a possibility here. Additionally, this device will carry an 8 megapixel rear camera and a massive 3000 mAh battery. Somehow, ZTE is supposedly shoving all of this into sub-9mm body. The ZTE P945 is not going to be a ground breaking smartphone. But with a quad core processor and a huge battery, not to mention an enormous screen, this device could sell well in the exploding Chinese mobile market. Are you excited to see the real ZTE P945? Do you think that ZTE has a chance up against Samsung and Apple? Let us know in the comments below.